Whomp whomp. There're no Bluestreak - e-HOBBY Animes for sale. 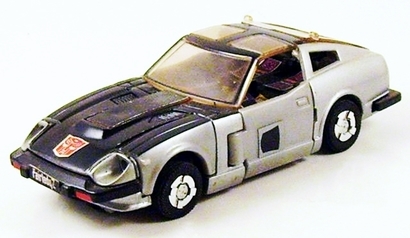 This exclusive e-HOBBY version of G1 Bluestreak was sold bundled in a set, though not packaged together, with a gold-plated version of Meister/Jazz. Often called "Anime Streak" by fans and collectors, this toy used the color scheme from the second version of his Diaclone toy (which was used as the basis for his cartoon and comic character model), with a black roof and hood instead of the original Transformer toy's silver. Unlike the original release, the silver car parts and the robot's head are not painted entirely silver. Finally I got the cartoon accurate G1 Bluestreak to go with my Masterpiece Bluestreak. Ehobby is the best.